Sustainable Santa brings the “Santa’s United” campaign to the Vista Farmers Market in an effort to curb childhood obesity. Santa’s Three Food Rules are aimed at curbing the consumption of the unhealthy sweets and snacks children eat. This is a new movement where “healthy happy Santas” appear at Farmers Markets and children can have their picture taken with Santa for free while being introduced to the joy of sampling fresh whole foods. 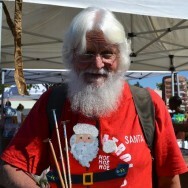 Sustainable Santa will be sampling “garden bites” at the Vista Farmers Market this holiday season. Santa also has some inexpensive guides that you will find useful this holiday season. If this year’s efforts prove successful, we will attempt to expand the “Santa promotes healthy eating” effort to a significantly larger audience next year. You can reach Santa at santa@sustainablesanta.com.